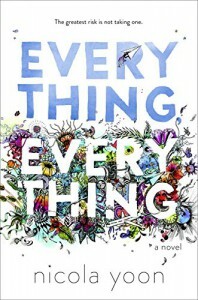 Everything, Everything is the debut novel from author Nicola Yoon. It is the story of a girl named Madeline who hasn’t left her house in over seventeen years. She has SCID, an autoimmune disease that is very rare and leaves her allergic to just about anything and everything. Her entire world is her mom and a nurse named Carla who is truly her only “in real life” friend. But then a family moves into the house next door and suddenly her world has expanded to include Olly. And that makes her want more than the walls of the home that has always been her prison. There is nothing not to love about this book. Madeline’s character is tragic, but she is smart and has learned to make a life for herself. It may not be filled with the adventure she craves, but she has found a way to live with it. But even with this life-threatening disease, she is still a teenage girl with crushes and everything else that goes along with that. Olly’s character is just as tragic, with a life that is less than ideal, with problems of his own. Yet somehow, the two form a bond that is at times funny, at times heart-wrenching. There is no question that this is an emotional read. Their individual stories can pull at your heart strings, make you alternately sad and mad. But there is also a lot of sweetness and a lot of smart humor. It is a romance, to be sure, but it is also a coming-of-age story with a lot of twists. I loved the uniqueness of the book, from the diversity of the characters to the format of the book itself. 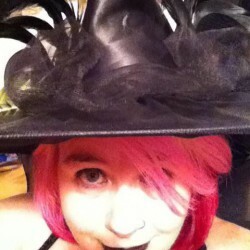 Instead of the all-American white girl, Madeline is multiracial, part Japanese and part black. And the format was interesting, chapters interspersed with sketches, diary entries, medical logs, IMs, and emails. It was a little bit of extra narrative that was really a big part of bringing them both to life for the reader. Overall: I can’t deny that I ended the book in tears last night. And this morning? A very definite hangover. This is an amazing read that I recommend from the bottom of my heart!